Alapeti Tunoa Jr. pleaded not guilty in District Court yesterday to second-degree murder in the death of ex-girlfriend Janel Tupuola. A grand jury handed down several charges yesterday against a 30-year-old man accused of beating a woman to death in front of horrified Kailua witnesses last week. Alapeti Siuanu Tunoa Jr. faces charges of second-degree murder and assault, among other charges, after he allegedly killed his former girlfriend, 29-year-old Janel Tupuola. 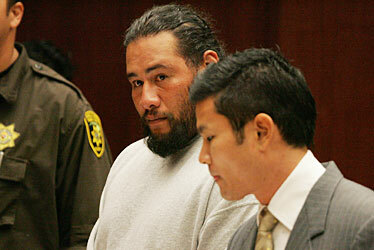 Tunoa pleaded not guilty in Honolulu District Court before the indictment was issued later in the day. The man accused of beating his former girlfriend to death in a Kailua public roadway in front of horrified witnesses pleaded innocent yesterday. A state grand jury indicted Alapeti Siuanu Tunoa Jr. yesterday on charges of second-degree murder, first-degree criminal property damage, first-degree terroristic threatening, first-degree assault, place to keep loaded firearms, and possession of a firearm as a convicted felon. Before the indictment, Tunoa pleaded not guilty in his initial appearance before a district judge. Several deputy sheriffs were on hand as Tunoa entered the courtroom. Tunoa, who weighs 340 pounds and is 6 feet 2 inches tall, is accused of beating 29-year-old Janel Tupuola to death with a shotgun in a residential Kailua roadway. Tupuola and Tunoa have two children together. 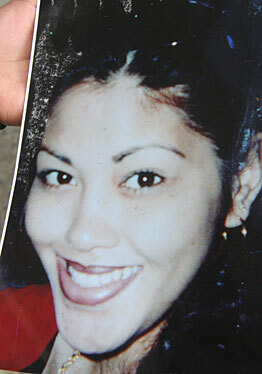 Tupuola's relatives said she was trying to get away from Tunoa, but that he found her while waiting at a baby sitter's home. Several witnesses said they watched helplessly as Tunoa beat Tupuola to death. A 69-year-old retired Marine tried to stop him. Police said Tunoa struck the man several times before turning his attention back to his ex-girlfriend. Tunoa is being held in lieu of a $1 million bail. He was convicted of first- and second-degree robbery in 1996 and 1997 respectively, and has an extensive juvenile record. Tupuola is survived by her parents and five children.